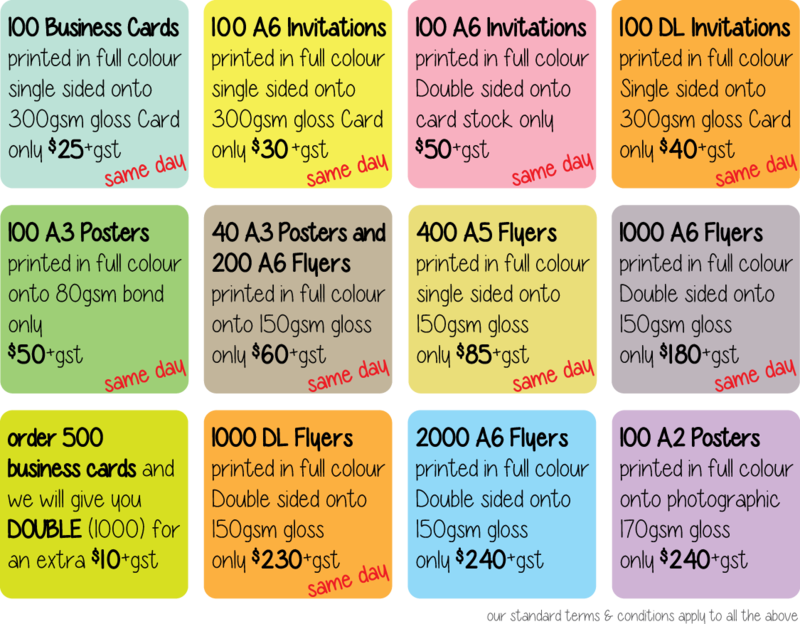 At ACE we are consistently offering the highest standards of print quality, professional customer service, and of course great prices. We have added a few Extra Special deals that we will update regularly. This price list below represents but a sampling of our popular printed items. If you don’t see what your looking for, please contact us. You will find us friendly and easy to deal with. We look forward to hearing from you. A2 – 594mm x 420mm. Available on a range of stocks. A1 – 841mm x 594mm. Available on a range of stocks. A0 – 1189mm x 841mm. Available on a range of stocks. We can adjust, alter or completely create a new design/layout for you. Let us work with you, we can offer expert advice & cost-effective solutions for your specific needs. * Discounts for Multiple cards based on the same design. * Free alterations to your layout if needed. No set up charges. No download charges. No hidden charges. When you place an order with ACE Design & Print, the order is final. Approval of artwork proofs and payment must be completed prior to delivery of the order. Please make sure you are aware of the terms and conditions before ordering. Printing turnaround will vary. The average turnaround time for most printing products is 3-5 business days, this is not a guarantee but a guide. Printing does not commence until the Proof is approved and the Order is paid for in full. Design time is extra. When accepting artwork proofs from ACE Design & Print, you are held fully responsible for accepting all content. This includes design, spelling, grammar, numbers, layout and all content. It is your responsibility to request another copy if your proof is difficult to read. We will print exactly what is accepted in the final proof. No reprints at our expense will be printed. All printing products must be paid for in full before they are sent to print, unless a specific arrangement has been made. The printing process will remain stalled until full payment has been confirmed by ACE Design & Print. Payments by electronic funds transfer or cheque must be fully processed and received before printing commences. An account is considered overdue if payment in full has not been received for an order in over 30 days from the time of approval of artwork proof is given by any method. Interest may be charged on any overdue accounts, and the customer agrees to pay any and all costs, fees, expenses, inclusive of commissions, legal expenses and disbursements incurred in obtaining or attempting to obtain payment of any overdue account. While care has been taken in posting correct prices on the website, ACE Design & Print has the right to remove or change products and prices without notice. All quotes are valid for 30 days only and may be subject to change after this period.